This is another recipe made especially for one of our awesome Kickstarter backers and close friends. She requested either Mexican or Italian and since we had a couple of other Mexican recipe requests, I chose Italian. And what’s more classically Italian than lasagna? Most lasagnas are rich and heavy, and although delicious, can leave you feeling sluggish. Not this Vegan Zucchini Lasagna! Longs strips of zucchini take the place of lasagna noodles and savory portobello mushrooms pack the dish with plenty of vegetables for a hearty, yet healthy meal. The whole meal comes together quickly, just 20 minutes of prep then idle cook time in the oven. This Vegan Zucchini Lasagna can be made in a flash if you have our Vegan Pesto on hand. If not, don’t fret! The Vegan Pesto only takes 5 minutes to prepare. This Vegan Zucchini Lasagna has it all. It's hearty, healthy, and gluten-free. Pair it with a simple green salad for a light, yet satisfying meal. Preheat the oven to 400. Peel the zucchinis and slice them into very thin lasagna "noodles." Lay them on a pan lined with a paper towel and sprinkle the zucchini slices with ½ tsp of sea salt to draw out the excess water. Set aside for ten minutes, then blot the water off with the towel. Meanwhile, scoop the spores from the portobello caps and slice them into medium sized strips. Squeeze the excess water out of the tofu and crumble it into a medium bowl. Stir in the pesto and mix well. Heat ½ tbs olive oil in a skillet on medium. Add the portobello strips and sauté for 3-5 minutes, set aside. In a 9x13 glass pan, lightly grease the sides and bottom with ½ tablespoon olive oil. Layer the bottom of the pan with zucchini slices. Pour ½ cup of marinara on the zucchini, then cover it with ⅓ of the pesto tofu. Add 2-3 slices of vegan cheese and repeat the layers until the pan is full. 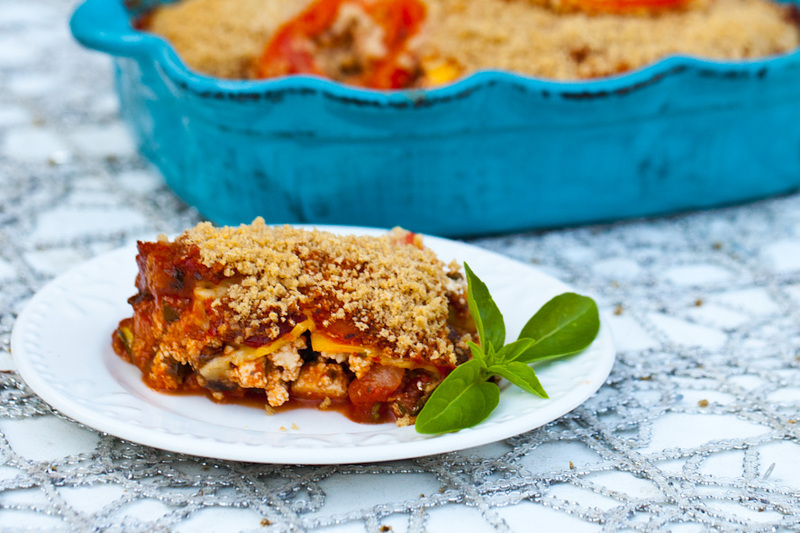 Sprinkle the breadcrumbs over the Vegan Zucchini Lasagna and arrange 3 tomato slices on top. Bake at 400 for 40 minutes. Let sit for 5 minutes before serving. Hi! Could I use the cashew cheese recipe that you shared for the quesadillas, for this Lasagna recipe?